Subaru of America is partnering with Amazon to create a custom co-branded landing page featuring its new three-row large SUV, Ascent, and Amazon products together. The page will house a Playfull video that includes an Amazon Alexa-enabled device, as well as information about the Ascent and Alexa-enabled products that can be used within the car. Playfull is a new co-owned platform from Buzzfeed and NBCUniversal. The content will share road trip tips, provide back-to-school hacks and highlight growing up in a big family. Through the NBCUniversal partnership, a Subaru Ascent will be present on the "Today" show plaza for a back-to-school segment featuring tips for families gearing up for the return to class. Starting in late September, the Ascent will be featured in a co-branded campaign across some of Amazon’s highest-profile media placements, including the Amazon homepage, Amazon Fire Tablet and Fire TV. TV spots, breaking today, feature three different Ascent owners to play up the versatility of the automaker’s largest vehicle yet. The spots, from Carmichael Lynch, will run in 30- and 60-second versions. "Dream Big" features two concerned parents struggling to reconnect with their teenage daughter. "Big Day Out" shows a curiously precocious little girl leading a big family around town to visit her favorite spots. 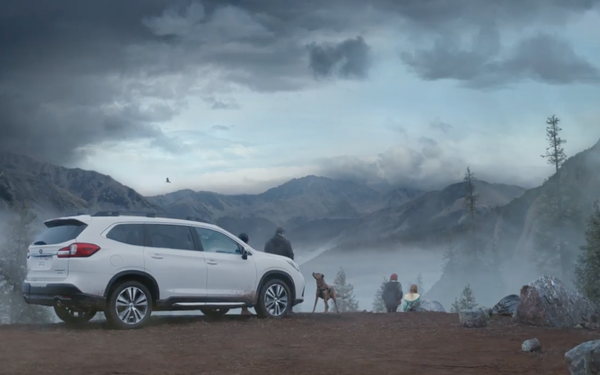 “Important Moments” is a cinematic, suspenseful commercial that shows a father recalling a burst of tender family moments in an instant -- which is the time it takes his Subaru Ascent’s EyeSight Driver Assist Technology safety feature to engage. The spots, which feature a new tagline, “Love is Now Bigger Than Ever,” also highlight other safety and performance features, including Subaru Symmetrical All-Wheel Drive. The new Ascent campaign "showcases the love, dependability and life-affirming moments that matter most to our Subaru drivers,” stated Alan Bethke, senior vice president of marketing, Subaru of America, Inc., in a release.